This article presents a grief-oriented, music-directed model that counsellors can use with grieving clients. The model is based on several assumptions: (a) counsellors can use music to assist grief-stricken clients; (b) grief occurs along a continuum; and (c) a spiritual framework for grief resolution and music intervention provides an effective venue for working with grieving clients. Success of the therapy implies the ability to constructively develop a sufficient level of empathy that allows clients to speak openly about their problems. Although our work was primarily developed and tested with addictive clients in recovery (Gallant, 1992; Gallant, Holosko, Gorey, & Lesiuk, 1998; Gallant, Holosko, & Siegel, 1997), we have generalized the approach successfully to grief-stricken clients. We believe that the prevalence of the spiritual dimensions of both grief work and music intervention have strengthened the generalizability of the model (Gallant, Holosko, Gorey, & Lesiuk, 1998). 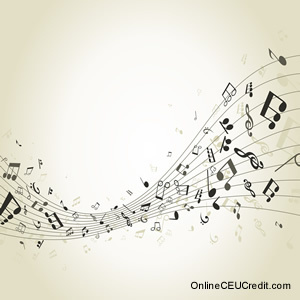 Using an exploratory case analysis approach, this article demonstrates how music intervention can be used along a continuum of grief within a grief counselling working model. The key to using the model is to identify where on this continuum the client is, which allows stage-specific issues of grief resolution to be dealt with. The model involves a unique blend of counselling, music, and themes of rehabilitation and recovery anchored in a spiritual base. Within a wellness paradigm, we discovered a curative element through using topical therapeutic themes and music intervention as a healing agent that provokes memories during the grieving process. This dynamic interchange provides the impetus for clients to get in touch with many prominent grief themes, including resolving discord, naming hurt and pain, moving toward a more congruent meaning of life, reframing grief, and beginning to experience a sense of peace and fulfillment by connecting with people. A wellness paradigm recognizes the need for individuals to consider dimensions such as self-responsibility, stress management, physical fitness, choice, sensitivity to one's environment, adaptability, and functioning at an optimal level to enhance life (Mullen, Gold, Belcastro, & McDermott, 1990). A wellness paradigm replaces glorification of negative behaviour and a corresponding negative mind set with attention to self-empowerment, wholeness, and fullness of life (Corey & Corey, 1993; Townes, 1984). The five case scenarios presented here represent a mé1ange of pain and excitement, anguish and exuberance, imprisonment and liberation—experiences that clients have encountered on their journeys of self-expression, self-discovery, and self-actualization. These scenarios are offered to promote discussion among helping professionals, including those in the field of mental health and those in hospice and cancer clinics, who might find music intervention and poetry a source of insight and inspiration when working with grieving clients. According to the model, dealing with loss and grief involves three sequential steps: (a) an inner-directed process of searching the self; (b) searching outside oneself; and (c) receiving affirmation from others. The onset of loss, grief, or demise involves elements such as surprise, disbelief, guilt, blame, self-accusation, positive and negative memories, and sharing of inner thoughts and feelings, culminating, in the context of a faith/hope journey, in resignation. Inner-directed searching of the self requires dealing with one's blindness, denial, and isolation, and discerning one's loss, often reacting with episodes of confusion, anger, depression, and self-pity. It necessitates renewing and increasing self-worth by submitting to God's will rather than to self-will and acknowledging any residual elements of pain and guilt. Finally, searching the self means reminiscing, finding meaning in one's emotions, and accepting one's life predicament. Searching outside' oneself involves engaging in the life cycle through interpersonal involvement and consciously reaching out to others with renewed commitment. It means communicating an honest sense of willingness and cooperation, directing one's life to a greater sense of responsibility, and working through feelings of angst. Individuals may be reluctant to enter this stage and thus may be unable to deal adequately with the loss or effectively handle the bereavement process. Counsellors must respect the client and move at the client's pace during this stage. The final stage is characterized by openness and receptivity to the goodwill of others facilitated by several factors, namely readapting and changing one's attitude, believing in others through love, developing new relationships and renewing old ones, and opening one's soul to others, thereby gaining freedom, autonomy, and empowerment. A heart open to a freeing experience connects with perception, sensation, fantasy, imagination, knowledge, and the fullness of life and enhances the individual's sense of pleasure, sensuousness, beauty, truth, art, and freedom. Breaking the boundaries of our "legitimate grieving process," we discover the richness of being in touch with a spiritual force greater than ourselves through the value, goodness, and presence of other people. Figure 1 presents a continuum of grief containing five domains that clients normally experience during loss and grief resolution. Often these domains overlap. Using the self-other spiritual approach and actual music compositions and case materials, we will demonstrate how the unique blend of music intervention and grief work complements and enhances a client's ability to resolve troubling and traumatic issues at various points on the continuum. To develop trusting relationships with grieving clients, counsellors must accept them where they are at. Indeed, working in the client's "real-life world," however murky, confusing, or illogical it may seem, builds the respect, empathy, and openness that from a spiritual perspective allows counsellors to penetrate the depths of humanness and emotion (Fox, 1991). For example, counsellors working with clients in the final stages of AIDS can find this experience very difficult but also deeply moving. In our death-denying culture, friends and relatives may avoid talking about AIDS or impending death, frustrating and angering the ill. Being open gives clients and those close to them a chance to bring closure to a life journey. Introducing a song in this context can be a catalyst in the dynamic worker/client relationship by helping clients take control of the stages of dying (Kübler-Ross, 1969) and providing counsellors with insights into how they can be a continuing source of support and encouragement. In this healing experience, clients can be offered opportunities to integrate the dying process, and counsellors can learn better ways to deal with the stressors that come with providing nurturance and comfort to an ailing person where all parties can openly express their real feelings (Shuiman, 1998). The song in Appendix A was composed during a meeting with a client at a group encounter. The client, a talented music teacher and songwriter, had been diagnosed with HIV. His spontaneity, zest for life, and sense of caring and sharing motivated the first, author of this article to compose the song. It is about the important role of the caregiver and the need to "be there." It also addresses how the counsellor can identify the insights and approaches necessary to be truly empathic during the dying process. Many music therapists have consciously restructured and integrated the actual experiences of their, clients' personal journeys and have expressed their meaning through songs, poems, or prose (Gladding, 1992a). Music becomes a vehicle through which spiritual insights emerge that may facilitate necessary emotional adjustments (Bruscia, 1989). Finally, combining therapist role modelling with music intervention with their own artistic responses can provide a supportive atmosphere where individual clients may critically evaluate their needs through positive identification with the counsellor (Adolph, 1983). "You don't know me, but I am Stan's sister and I just wanted to thank you for your wonderful poem about Stan. The poem was read at the funeral mass and we were all touched by it. As you expressed, Stand did "walk with God," so I think we all mourn for ourselves at this time to have lost him so soon. But, I guess, as you said, "his mission was complete." His three sons are a fine legacy and the love he and his wife Lynnie shared was a wonderful thing to see. Rando (1984) believes that the ritual of song such as the one described above is a powerful therapeutic ally, symbolizing transition, healing, and continuity, and helping to facilitate the grieving process: "The power [of songs] comes from the faith that the individual has in their ability to provide meaning" (p. 104).